Aunt Carrie Fenn's husband has little to do with our genealogy, yet he was an indian and moved her to Indian Nation Oklahoma, which adds a little confirmation to the Fenns being of indian blood, like Carrie's brother, Cecil was our grandfather and claimed to be Cherokee. Carrie and Cecils' mother was Anna Stone and her Uncle Charles Stone named his sons Osceola and Tecumseh........so........... the plot thickens. From Bullock County Alabama to Montgomery, Carrie married after 1920 to Ben Johnson of Choctaw Nation, Texas. They are found on the 1930 census of Creek, Oklahoma. Ben's parents were America Emeline Mills and Nathaniel B. Johnson of Alabama, who moved around a lot, into Arkansas, and into Texas, where the census indicates some children born in Indian Territory. Some of Nathaniel's siblings may have also been born in Indian Territory. Ben's brother signed an affidavit stating that his mother was full blood Cherokee and that his father would not allow her to sign onto any of the Indian Rolls. Nat named a daughter Ellen after his sister. Ellen Gray Johnson, b July 12,1856 Springfield Alabama, d April 26,1952 Monument, Lea County New Mexico, she married William Fletcher Weir, on Dec 16,1881, Brady , Mc Culloch County Texas( I have original Certificate) William Weir wa sborn Dec 19,1854 Polk Missouri, d August 8 ,1937 Monument , lea County Texas, they lived in Texas until early 1906 , when they went by covered wagon with their 8 children to Lea County NM, William purchased the famous, historical Hat Ranch. Nat also had a sister named Louisa Powell. Nathaniel's mother was Mary Ann Macon and her ancestors had something to do with the founding of Macon County Alabama. Ironically Carrie Fenn's father was also born in Tuskegee, Macon County, Alabama. The story of Ben returning to Alabama is unknown. It is also unknown how he met our Aunt Carrie. There is the possibility that she traveled to Texas to visit her Uncle Madison. They had only one child, a daughter named Dorothy and how her name is special to them, is another mystery to uncover. Carrie's grandfather's GrandFather served in the American Revolution and recieved Land Grants in Georgia - Travis got several plats of land, one being an island in the middle of a swamp - History mentions a Fenn Bridge - Travis was the father of Elijah, and Elijah had our John Fenn in 1829. Travis married an unknown "Mary" who might have been native american and then Elijah married a Martha Rich who had an unknown mother named "Abiah". It was not uncommon for one to marry a native american and give them a Biblical name. Death Certificate of William Franklin Fenn - apparently ill for some time, he moved his family into downtown Montgomery Alabama and his boys worked for the railroad which was just down the street from their home. Union Station was built along the Alabama River and still stands. Historical State Markers indicate this area was once an Indian Village. 1860 Tallapoosa County Alabama with son Pleasant on the next page of the census living near a Emily Johnston. Death Certificate of Cecil Earl, said to have been a crazy indian who drank himself to death after the loss of his wife. He had served half of his life in the US Army. Named his daughter Annie after his own mother. Carrie's father managed his uncle's farm - The history book of this county mentions life among the Indians and how they helped Matthew Fenn work his farm. Carrie's grandfather John Fenn served in the Civil War, married Emeline Harrell and settled into Macon County Alabama. Names in our family tree with links to their photos or documents. Grandpa John Brookes of Holland in Pennsylvania while his son went to Tennessee working as a tailor and married Roxanna Permilia Smith - they went to Texas and that is where he is buried - she came back to TN and remarried a Doctor Smith. Our families were together in Pennsylvania and again in Ohio. Several intermarried and we find them on census records. Perhaps they came from Ireland together and that may be how they all settled into Pennsylvania beginning their journey in the free world. History shows that many Irish fled to Scotland, and called themselves Scotch-Irish when they arrived in America. Their descendents went west into many new territories. Some are buried in Quaker City - nice thought to ponder. Perhaps they were the Quakers we read about who got along so well with the Indians in the 1700s. There was much Indian unrest back then and several tribes moved into Ohio and Kentucky; many intermarried with the whites and continued westward. LOCATED IN MOYAMENSING, PHILADELPHIA, PA some think that Hugh Cochran was the father of Alexander and William. In 1790 I found a Hugh in South Carolina but he is still there in 1810. They surely did have large families. lives near Mariah Cochran and Elzira - this must be Elizabeth Cook who married John Jr.
located in Adams County, PA with 14 family members and searching the census pages near him I find NO familiar names other than a Thomas Cochran with 13 family members. Names of wife and children were not added to these census records so one can only speculate unless they locate a will in the state's will book for more evidence of this man's legacy. next to Alexander Cochran and near many Henderson families - Jacob Benjamin Cochran is in California working as a Miner, likely searching for Gold with his brother John. Found in Pittsburg, Allegheny County PA this couple has only one child. So this obviously young Jacob could be the son of our Alexander. Peter and Thomas are found here. Thomas may be the father of Sarah Sturgeon who married John Clendenning. I tried to trace the parents of Thomas and his mother Sarah Ferguson and believe that her father was a Thomas Ferguson found in the area. Alexander Douglass is on this page too! this shows he has 11 children in 1790 ?? This census record only shows head of household and not where he came from, so we can assume he is from Scotland or from Ireland - maybe a large family came over the sea or perhaps the other family trees online are only made up from speculation. In the 1800s there were dozens of Alexanders in census records and dozens more of the Williams so they could all possibly be related to this one Alexander. It would be very difficult for anyone to be certain of the connections to this one man. Edgefield SC - since I ran across Alexander Douglass with the Sturgeons, I felt like finding his wife after he passed away. IF this is our Mary Molley, she has not yet married George Little - Remember that her husband went on a survey with Molley's brother John Handley to Kentucky and was murdered on the way back to Pennsylvania - she feared the Indians and left. 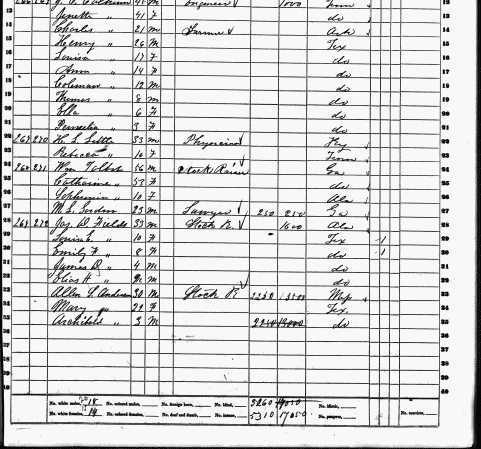 Hamilton Township, Butte, California - Jacob is a Miner living with his brother John Henderson Cochran so now we know why the other census record showed Mariah alone this year....apparently they all went searching for Gold before moving to Iowa Territory. both from Ireland and in Pennsylvania; are they related ? Was this Agnes a Henderson? on Ohio census page next to Mariah and Elzira, so he must be Uncle Thomas. hard to find Clendenning on census records but people often changed the spelling of their names - Nancy Clendenning married a William Henderson about 1797 in PA....some were found in North Carolina and I wonder if they migrated to Pennsylvania....the search continues for this line. Saving a few names found on census in 1790 thru 1820 which may help us later on with this family tree. Jacob Cochran married Clora Jane Miller about 1879 - her mother was Mary Clara Parker. Mary's mother was Sarah Tefft and her father was Dr. Wanton Parker. Parker families came from Worcestor Massachusetts, while Miller families from Rockingham Virginia, into the midwest. Mary Clara Parker married James Miller in 1850 Bloomington, McLean County, Illinois. Their daughter Clora Jane Miller became my great grandmother. She smoked a corn cob pipe,and one was made of clay; she learned about making her own medicine from her mother. Family story is that her mother shared medicine with the Indians. Clora's grandchildren spoke of her staying with them after becoming widowed and had no where to live. She spent a few months here and there with each of her children and their families and survived nearly thirty years longer than her husband. Her husband Jacob and children. James Miller and Isabella are in their 70s now, with one son named Alexander, this must be our line. Marriage REcord of John Brooks to Roxanna in 1860 Tennessee before they moved to Texas where they had a son John who later married Annie. Documenting the trails of the old ones. May have been my grandmother's half brother. Into Kentucky, or Alabama, they migrated in 1800, 1810, 1820, and their paths are documented. Great great great great grandpa to Charles Wayne Brooks was Elijah Lee. Elijah was born 1777 in South Carolina and migrated to Chambers County Alabama. Elijah Lee was born in 1777 South Carolina. He married Malinda Phillips in Greene County Georgia, the daughter of Mark Phillips. They settled in Chambers County Alabama about 1830 not far from Andrew and Alsey Cooper also from South Carolina. Sarah's son was Levi Benjamin Cooper and he married Sarah Elizabeth Carter in Montgomery and had Susie. Sarah's father also came from South Carolina, born 1820 Thomas R. Carter's parents bought land in Talladega. His father was John Wise Carter of South Carolina and his parents were Elizabeth Wise and John Carter. Chambers County Census shows that Levi was the son of Charner P. Cooper and Sarah F. Lee, the children of the Lee and Cooper families who migrated into Alabama from South Carolina. Sarah Lee and Charner Cooper married - he served in the Civil War and their son Levi moved to Montgomery and worked on the farm of Thomas R. Carter and fell in love with Carter's daughter Sarah, whom he married and had a daughter named Susie Mae Cooper. They came from the Lee and Cooper families of Chambers County and lived not far from each other. Family says that Elijah Lee might have bought his land from a Creek Indian and they surely lived in Creek Indian Territory. Annie Lee Carter changed her name to Anne Alice Carter, because she had no idea that her grandmother was Annie Lee Stone Fenn Carter born about 1875, so she chose to use her own mother's name Alice. Annie Lee Stone might have been the full blood Cherokee we are searching for. Of course Annie Lee Stone might have married a half blood Wm Fenn in 1893 as we see the Cherokee blood runs strong in his mother's line of Harrell. Grandparents of Frankie Lavern Cochran left Kentucky for Arkansas, Benjamin Coonfield and Latte Cedonia Little. Living in Mesa Arizona, one of my dad's receipts for pay at his job. Living in Mesa Arizona, Uncle Billy took this picture of my family and his first wife Lillian. Victoria, daughter of Cecil Jr. So easy to see his Cherokee features. So easy to see his Cherokee features. Uncle Joe was told to sit in the back of the bus !!! Who is Walter Stone listed as pall bearer and the others?? Evidence they were here! They worked together and died together. Now we know his real parents ! The first Home Steaders of the City, arriving from Iowa Territory after many years in Guernsey Ohio. Jacob and his first wife with six daughters appeared on the 1870 census of Iowa, then his second wife on the 1880, as they prepared for the long journey south. Much of their families lived near them and some even followed Jacob to Kansas. Some of his children and grandchildren and great grands remain in Kansas while some ventured elsewhere and began a vast lineage of their own in Arizona, California, Colorado,Missouri, Oklahoma and Alabama. Regarding their widespread lineage and contributions from many others involved in the study of the families of Jacob.